“Simple Delights” is arriving at SciKnowTech with “Bakeology” – A workshop with unique blend of Science and Art in Baking. 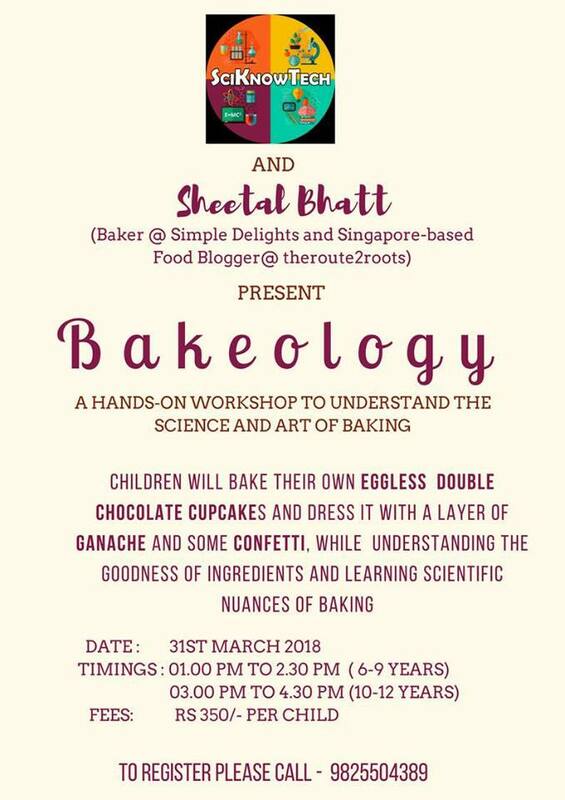 Sheetal Bhatt, a passionate home-cook and a food-blogger @ theroute2roots – who shares the lands of Singapore and India, alongwith Dr. Megha Bhatt of SciKnowTech, will take kids to fun-ride of baking their own cupcakes and understanding the science behind that to live upto SciKnowTech philosophy of “Experiential Learning”. Kids leave happily with “take-away” cupcakes for parents to get pampered. March 31, Saturday @ SciKnowTech (Satellite, Ahmedabad)…….